Hoffmann's classic Christmas fairy tale, immortalized by Tchaikovsky's ballet, is brought to life by the gorgeous contemporary artwork of Finnish illustrator Sanna Annukka, and is the perfect holiday gift for adults and children alike. 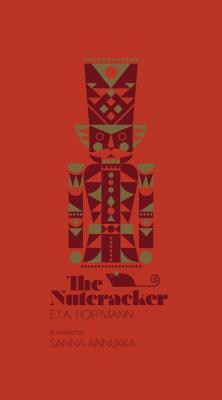 The Nutcracker captures, better than any other story, a child's wonder at Christmas. On Christmas Eve, Fritz and Marie excitedly await the arrival of Godfather Drosselmeier and the marvelous gifts he brings for them every year. When Marie discovers a rather curious nutcracker doll amongst the presents, she suddenly finds herself caught up in an age-old battle and ultimately transported to a magical world of sugar-frosted castles, chocolate kings, and true love. This cloth-bound edition combines the charm of Hoffmann's original eighteenth-century tale with the freshness of Sanna Annukka's gorgeous illustrations in this striking keepsake edition that will be treasured and reread by you and your loved ones for years to come. E. T. A. HOFFMAN (1776-1822) was one of the best known and most influential authors of his time. He exploited the grotesque and the bizarre in a manner unmatched by any other Romantic writer. The Nutcracker and the Mouse King was written in 1816 for his children, nephews, and nieces. SANNA ANNUKKA is an English/Finnish printmaker and textile designer. She designs collections for the Finnish textile brand Marimekko, and works on her own range of silkscreen prints and other products. "These two volumes--reprints of Andersen's classic fairy tales--are published in new hardcover editions featuring illustrations by Finnish illustrator Annukka. Annukka has designed for Marimekko previously, and incorporates Finnish mythological symbols intoher distinctive screenprint illustrations."